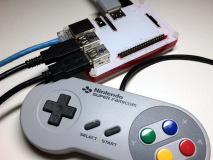 RetroPie is Linux based, so all raphnet-tech USB adapters are natively supported. But as I learned about small complications in getting multi-controller adapters to work, I created this page to help. ... And other single-player circuit kits and adapters. Constant scrolling in the game menus, undesired scrolling when switch back to the EmulationStation menu. Under Linux, the initial values of USB HID joysticks are not initialized properly. The way things currently are, even though the current values are requested from the adapter when it is first connected, the answer is ignored. This results in an inital axis postion pointing North-West. 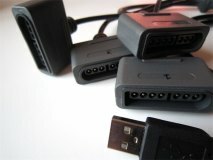 When there are several controllers or adapters connected, or if you are using one of our multi controller adapters, this has consequences. Imagine you navigate the EmulationStation menu using the first controller. Then you start a game that supports two players. You have used the first joystick, so the incorrect inital values have long been replaced. But the second joystick you have not yet touched is still pointing in the upper left direction, so the game sees a non-centred player 2 joypad. If the game main menu is controllable by both players, you get a continuously moving cursor until you press a button on the second Joystick. That's an easy workaroud. But if you have a four controller adapter with only ports 1 and 2 wired, how will you press buttons on joysticks 3 and 4 if their non-centered initial positions are causing unwanted operations? Well you can't, and that's a problem! usbhid_iostart.diff : Makes sure the answer to the initial GET_REPORTs are not dropped due to a lock being held. jsdev_initial_value.diff : Make sure jsdev generates initial events that are representative of the current state. Not strictly required since EmulationStation seems to be using evdev, but just in case. Follow the instructions from the aforementionned page to compile and install the kernel, reboot and enjoy! Note: This section does not apply to RetroPie 3.8 SD card images, thanks to the use of a 4.4 series kernel. The way multi-player adapters and boards are implemented make them appear as one single controllers in Linux. For instance, the adapters based on the 4nes4snes board (eg: Four SNES to USB) used to register as a joystick with 4 pairs of axes, and 32 buttons (8 per controller). But at some point, this became 2 axis (a mix of all controllers) but still 32 buttons. To fix this problem, I wrote a kernel patch to make the adapters appear as a set of independant controllers in march 2015 and it was included in the Linux kernel starting at version 4.2.0. With this patch, things are cleaner than ever. But as 2016-05-02, the kernel included in the RetroPie SD images is still one of the 4.1 series... So besides waiting, what can one do? Of course geting the kernel sources, applying the patch, compiling and installing it! But there is an easier way. You can add the following to the kernel command-line, and it will have the same effect as the patch. Upload the script to the Pi, ssh into the pi. Make sure the script is executable by using chmod on it, then run it once. Now reboot, and your multiplayer adapter now appears as multiple controllers! Enjoy! Raphnet-tech products work fine with RetroPie and Linux in general. Today the multi-controller require a bit of configuration to get working, but this is temporary and as time passes and Linux distros update the kernel they ship to their users, extra configuration will become unnecessary.